Recently, I’ve been re-examining the way I provide my birds with full spectrum light. According to research I’ve been doing, full spectrum tube lighting is more beneficial then compact fluorescent lights (CFL’s). With the recent full spectrum light movement in the avian world, there are lots of FS bulbs available for purchase, such as Featherbrite, Avilux, and ZooMed. All of these are CFL’s, but few companies offer a tube light as well. I have a double stacker cage in which my caiques reside. I refer to it as the ‘caique condo’. 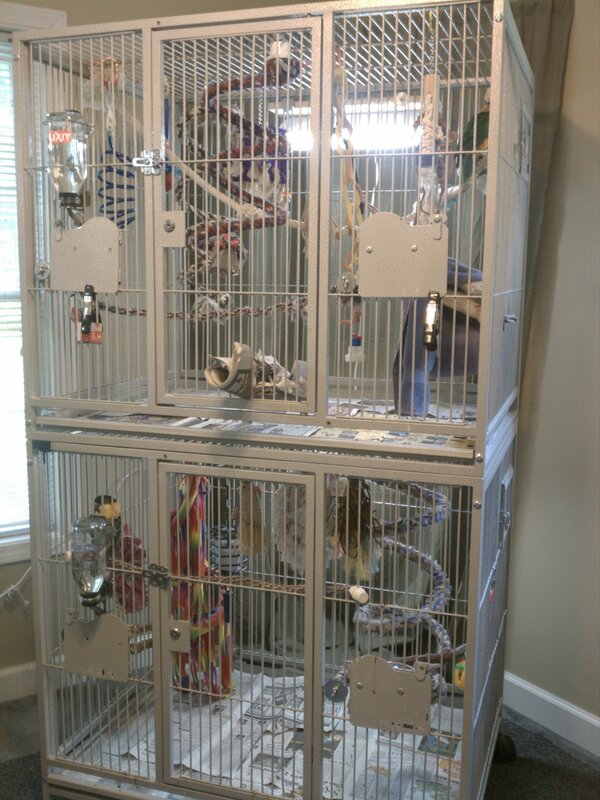 The cage is great and perfect for my birds – the only downside, however is that the bottom cage can be a little dark. 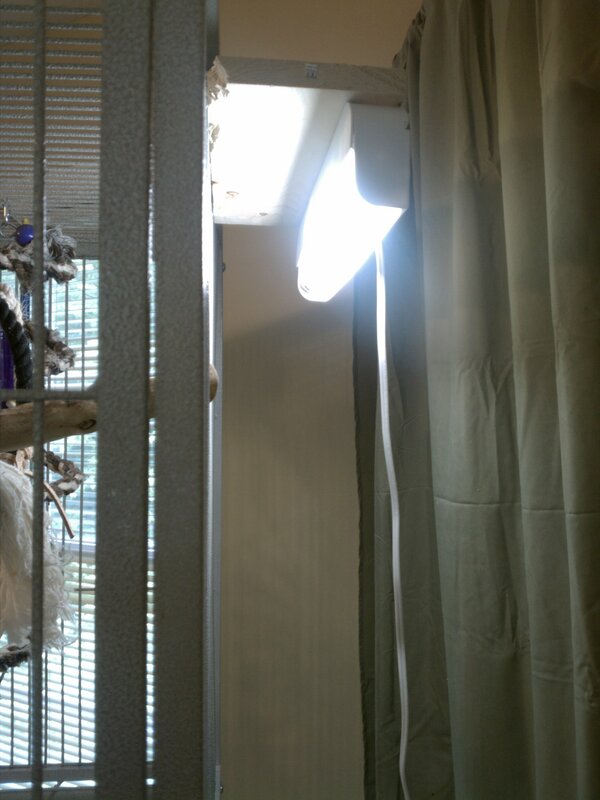 I’ve had clamp lamps hooked up to my cage, and have been using Featherbrite full spectrum bulbs to give my birds the appropriate lighting. However, it never seemed like enough – there was only one small area of light in the large cage. I was experiencing the same issue with my cockatoos dometop cage as well. I determined that I wanted to install tube fluorescent lighting for my birds to increase the amount of light they receive. One problem though : I can’t hard wire the fixtures into the wall or ceiling, as I need them to be portable. So, how on earth could I mount 18 inch lights to the cage, a safe distance from the cage so that the parrot inside can’t reach its beak through and get to the light? I had an idea of how to do it, but my lovely boyfriend helped me build the final prototypes. We went to Lowes and purchased under the counter, 18″ t8 electronic ballast* plug and play tube fixtures. Each fixture cost $11. Then, I purchased Philips full spectrum lights, 18″, to replace the bulb that came with the fixtures. Now off to the hardware section to purchase some lumber, and hardware. Then at home, using a saw, a drill, and my purchased goodies, we came up with a simple solution to affix the light to each cage, suspended a couple of inches above each cage where the bird cannot reach it. As you can see, Tooie is loving his light. This particular setup works well for a dometop cage – we experienced issues with other setups reflecting too much light forward or backwards out of the cage. This setup properly places the light in the middle of his cage and allows him to bask under the glow. The caiques cage was a little more of a straightforward build. This simple setup allowed me to attach the light to the side of the cage – an essential for the bottom portion of the stacker cage. The caiques can’t reach the light, nor the wires. Because of the way the light is positioned, it provides the bird with a lot of full spectrum light, but doesn’t require that they stare directly at the bulb all day. I ran each fixture to an extension cord and hooked both plugs into one unit, so turning on the lights for each cage is as simple as plugging them in each day and unplugging them at night. The total cost for 3 light setups was less then the cost of one ZooMed light and bulb. Another great perk to having these particular lights is the replacement cost of the bulbs. Previously I was spending $20 + shipping for each Featherbrite bulb. Now I can run to my local Lowes, and pick up a bulb for only $8. purposefully standing under or next to the light for periods of time. *If you do decide to build your own full spectrum light setup like this, a unit that has an electronic ballast is extremely important – electronic ballast do not flicker while on, or while powering on/off. Parrots are extremely sensitive to changes in light and can see the flicker of a fluorescent light even better then we can. 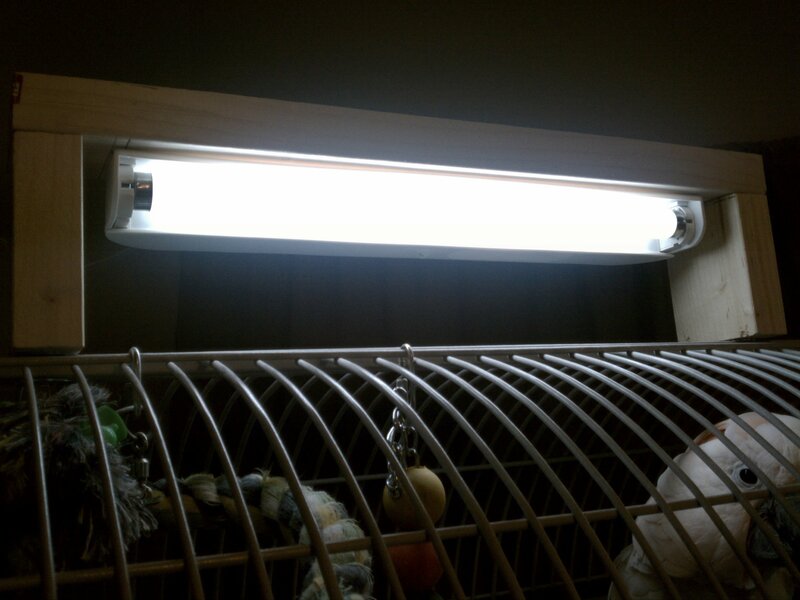 A full spectrum light in a fixture that flickers will not be of any benefit to your bird. I will try this kind of kind of lighting for my birds cages and see if they respond to the different lighting. Do you find this as effective as Featherbrite? Any noticeable differences?